In this section of the web site, we are putting together a series of articles which cover historical subjects relevant to Barford. We also have a separate section of personal reminiscences by Barford residents. Click on the link top left. 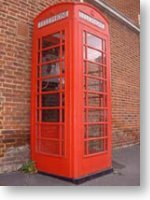 In 2010 the Parish Council agreed to to purchase the decommissioned K6 phone box on the Wellesbourne Road for the princely sum of £1 on condition that the Barford Heritage Group undertook its complete restoration and ongoing maintenance. We have raised funds and spent about £1500 on the project and are using this iconic piece of street furniture as a display capsule. Featured so far have been an enchanting winter diorama of Barford in the snow; Valentine’s Day; Shrove Tuesday (pancake day), Mothering Sunday; Feed the Birds and May Day. Where appropriate, brief details of the history of the traditions have been included. The displays are designed to appeal to all ages but the birds and animals are especially loved by children. There has been so much positive feedback. So, if Wellesbourne Road isn’t on your normal route through the village, its worth considering a detour.